When was the last time you had a romantic dinner with your significant other outside of the house? If you are like most people, you eat out from time to time, especially if you are celebrating your anniversary, a birthday or another special event. Yet eating out at a nice restaurant can get a bit old after you visit the best places in town a couple times. It is time to switch things up with a romantic dinner on the beach. This is your chance to enjoy something fresh and new while also enjoying one another. Imagine yourself sitting in a comfortable chair on the beach, enjoying a candlelight dinner with your lover beneath the Cabo San Lucas stars. Your toes touch the soft sand below while the gentle breeze puts you at ease. You sip champagne from a crystal flute, dine on gourmet food and discuss whatever you like with your loved one. It does not matter if you are married, dating or have a wedding date already set. Dinner on the beach with your lover will prove to be an experience remembered for a life time. 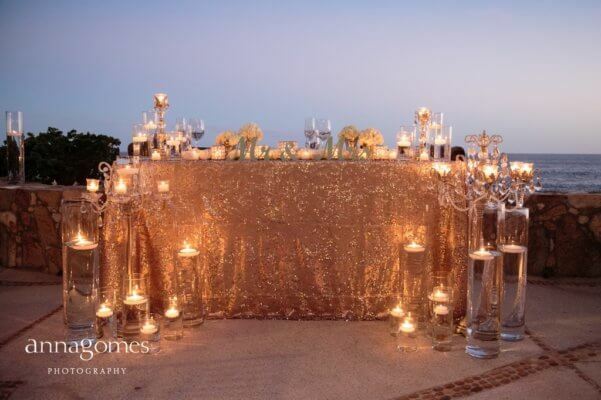 There is no sense trying to plan all the details of an unforgettable romantic dinner on the beach. Your focus should be on enjoying this magical night with your significant other. 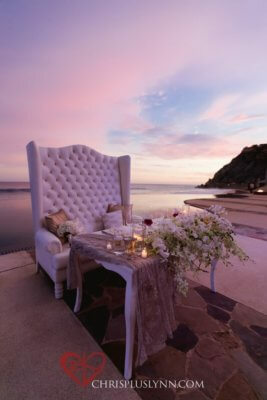 Cabo Linens and Things is here to create the perfect romantic beach dinner for the two of you to enjoy. We will tend to all the details of this event so you can have a special night without any worries. Perhaps you would like special décor to set the scene. We can add a lovely illuminated walkway to your beach dining table, complete with an arch, flowers, ivy and additional decorations. If you are looking for a certain aesthetic theme or color scheme so this event looks flawless for photos, let us know. 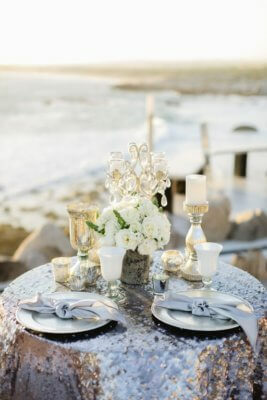 We will sit down with you, discuss options for your beach wedding decorations, theme, colors and other features. Our team can even add special touches like drawing “Will you marry me?” or the shape of a heart in the sand. Perhaps you would like some soft music to play as you dine with your better half. Maybe you would like tiki torches or lanterns placed in a circle around your dining table. We can even add a centerpiece arrangement, candles, flowers and other niceties to make this evening as special as possible. Be clear about what you are looking for in your romantic beach dinner. We can replicate your vision (or pinned Pinterest photo) right down to the smallest detail. This is your chance to outline your vision for the ultimate dinner on the beach with your honey. 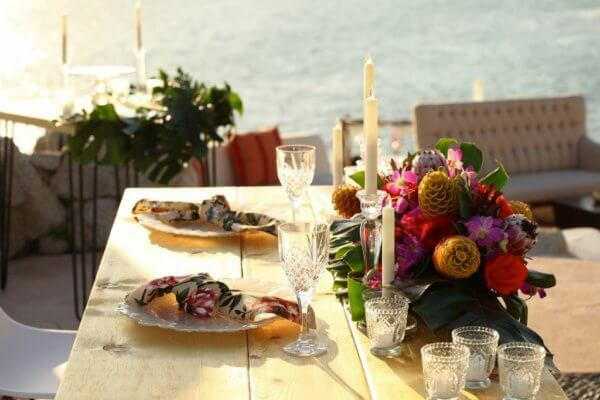 If you are not exactly sure what you would like your beach dinner to look like, we have plenty of ideas that proved successful for previous clients. From selecting gorgeous dishware to pinpointing the perfect centerpiece and accessorizing to bring out the best in the surrounding beach atmosphere, we do it all. As an example, driftwood often makes a lovely centerpiece for romantic beach dinner as it provides an earthy look while maintaining the beach theme. We will make this event look absolutely stunning. All you have to do is show up and enjoy the night in Cabo San Lucas with your loved one! This way, you won’t have to stress out about coordinating every aspect of the dinner, timing it just right, making sure the food is warm and all of the other subtleties that add up to make a meaningful difference in the quality of your night. Valentine’s Day is right around the corner. If you have not made plans for this special evening, consider a lovely beach dinner designed and coordinated by Cabo Linens and Things. This is your chance to enjoy an unforgettable dinner with your special someone in the perfect setting. If the beach is not your thing, opt for a relaxing dinner for two in a restaurant or another venue that provides the right level of privacy. If you are on the fence as to whether dinner on the beach is ideal for you and your lover, give it a chance! Those who have not experienced dinner on the beach almost always find the experience more fulfilling than initially anticipated. This special evening for two will undoubtedly live forever in your mind and your heart. This entry was posted in Party Decorations, Party Planners, Romantic Dinner, Romantic Dinner on the Beach, Special Event Decor in Cabo, Wedding Decor in Los Cabos and tagged dinner on the beach, dinner on the beach in Los Cabos, dinner on the cabo san lucas beach, dinner on the los cabos beach, Romantic Dinner in cabo san lucas, Romantic Dinner in los cabos.